Let’s start with full disclosure: I have been a loyal and happy USAA member for many years. The insurance and financial services company was founded in the 1920s to provide insurance to U.S. military service members and their families. Like most members, I am “very satisfied” with USAA. In my experience, the brand has excellent customer service and very fair pricing, especially for my auto insurance. That said, even though I frequently receive banking and credit card offers from USAA, I have yet to open any accounts. Still, I do pay close-attention to what the brand has to offer, so when I received this email last year, my curiosity was piqued, and I decided to investigate. Once again, I give full disclosure: had I been a “normal” consumer, I would have deleted this email and moved on. Since I am not a normal consumer (I am a financial services marketer), however, how could I pass this up? The initial landing page has a very simple and minimalist look and feel. It touted featured innovations and Innovation Awards and included a video that walked through the purpose of the site and the different sections. I was prompted to sign in with my USAA online account information to get into the full Labs site. Once there, I was presented with a quiz about a theoretical tool that could help me prepare for disaster. There were also “Pilots” – essentially product test panels or focus groups – that I could explore. I tried to join one about a Facebook Chatbot, but it was full, so I joined the waiting list. 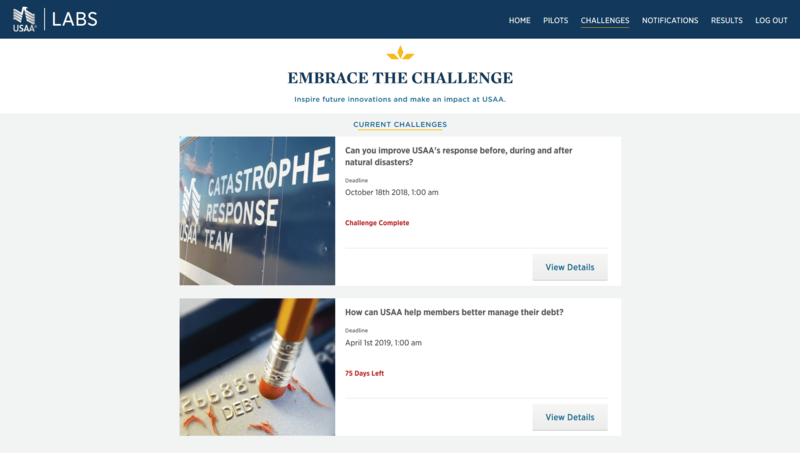 USAA Labs also includes a Results section where the brand shares what it has learned from members and the impact of those learnings on USAA products. I spent about half an hour on the site and took some notes and a few screen captures. 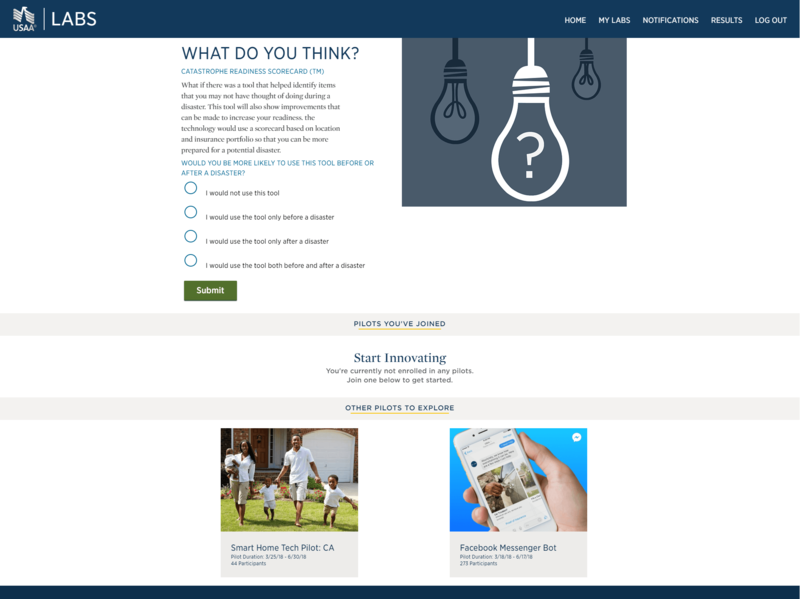 My initial reaction was very positive: USAA is clearly reaching out asking members to provide ideas and participate in tests. As a marketer, I know that harnessing this type of customer energy and support can be very valuable. As a customer, however, what I experienced next was a big disappointment… because I experienced a whole lot of nothing. When I check my inbox, there was no “welcome” email, no “thanks for taking our quiz” email and no “thanks for the waiting list for our pilot” email. In fact, since the initial email inviting me to sign up, I have received no follow-ups at all. I have since gone back to the site on my own, answered new quiz questions and tried to join another pilot. I was put on another waiting list, and still? Nothing. It’s no understatement to say that the lack of follow-up was a huge disappointment and a huge missed opportunity. I was practically jumping up and down saying, “This looks cool! I want in!” and USAA was not talking back. To be clear, I think that the site is an incredibly good idea, especially for USAA. It has a very loyal base, and Customer Relationship Management 101 tells us that a company needs to harness the enthusiasm of their most loyal customers to turn them into brand advocates. If USAA was seeking to create an “exclusive group,” it did not feel like that to me. 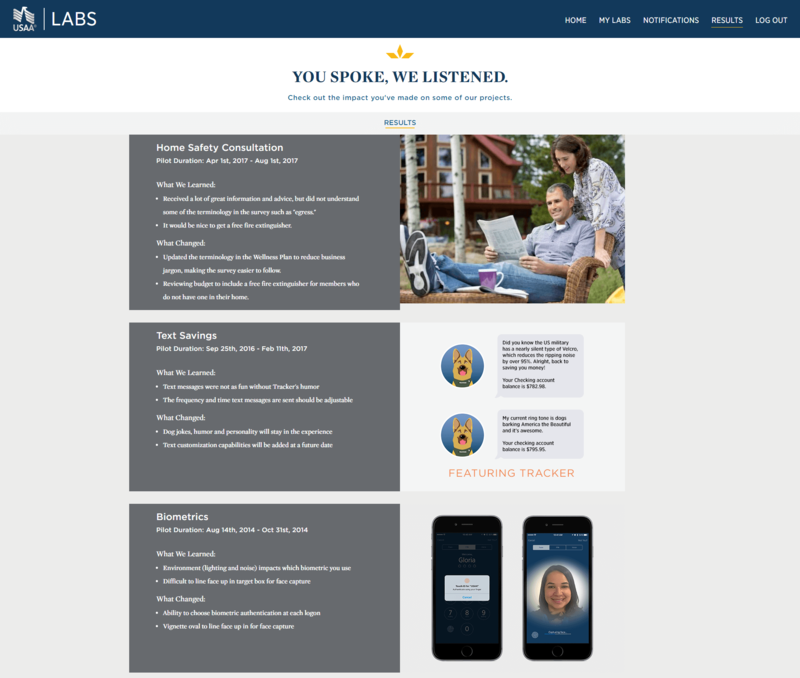 Setting my experience aside, USAA Labs seems to be doing some really good work. It appears to have started as an employee-focused initiative in 2016, expanding to members in 2017. Last year, its Chief Innovation Officer noted that Labs would help USAA scale up member research and feedback. Labs produce an interactive tool for Houston residents displaced by Hurricane Harvey, allowing them to see how flooding effected their neighborhoods and homes. And USAA used Labs to help develop a virtual assistant that integrates with Amazon’s Alexa. 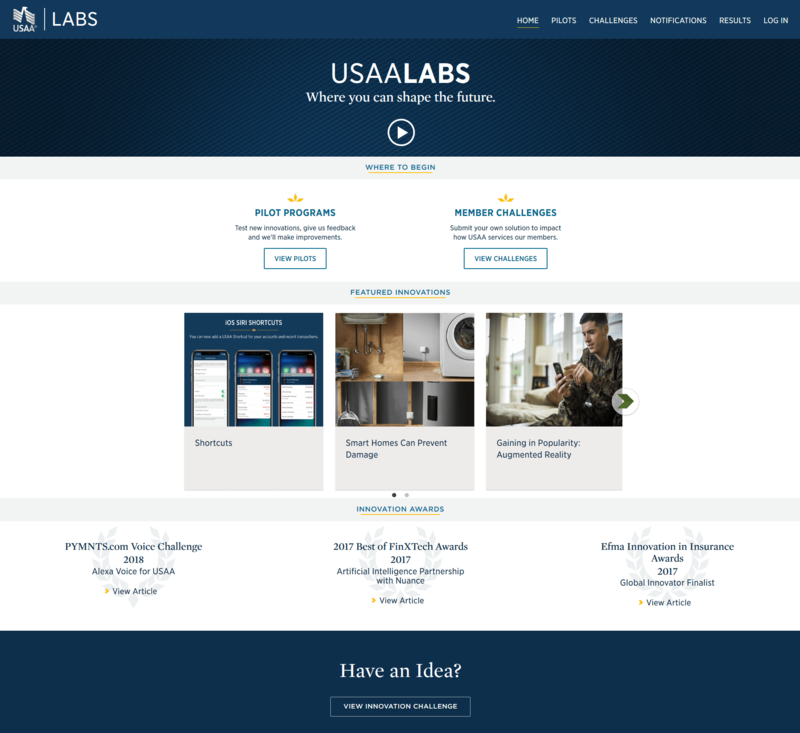 That’s a lot of good press for USAA Labs, but I had to seek it out on my own. 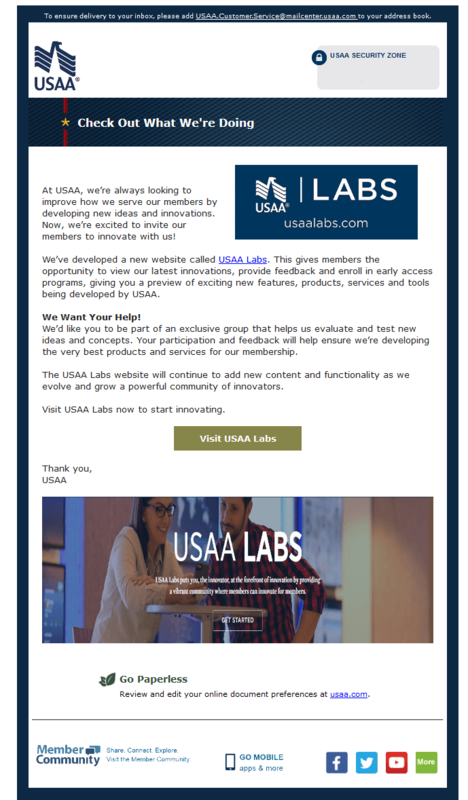 The real missed opportunity for USAA Labs is that the brand is not doing a good job at marketing its own product. That’s ironic for a company that is generally considered a great marketer. 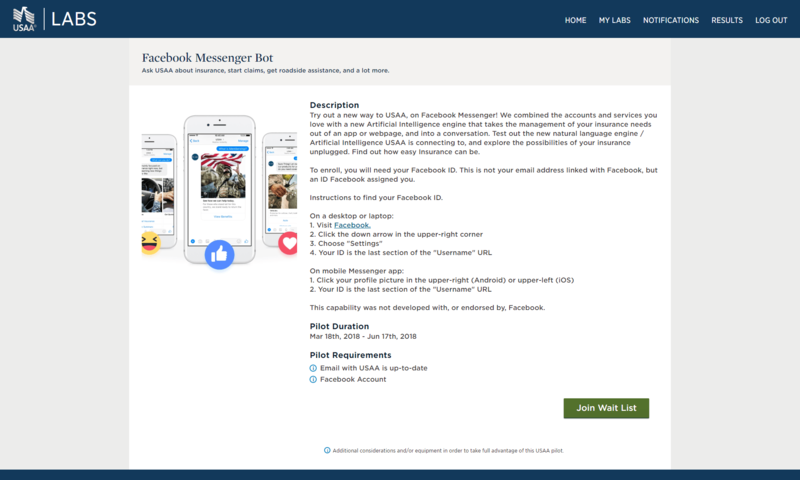 USAA could have an initial welcome communications stream to keep newly registered members engaged, and it could acknowledge when members are on a Pilot waiting list and invite those folks to sign up when new ones open. 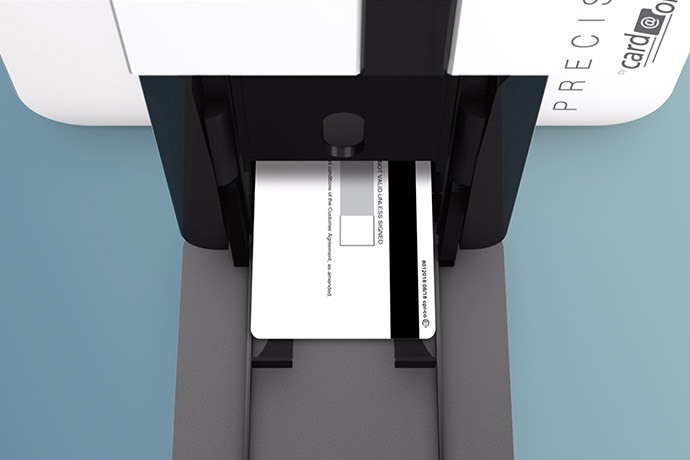 It could proactively share results or encourage members to take quizzes and contribute to challenges. USAA seems to be doing none of this. And maybe that is working for the brand. There is clearly interest. 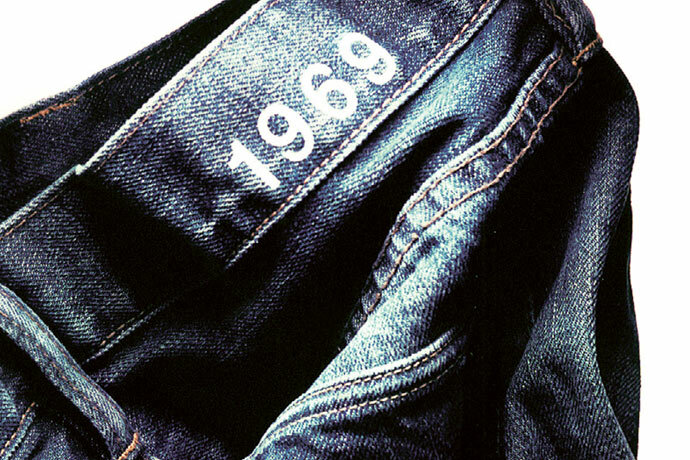 But it also seems to run counter to the promise of exclusivity. And if it really wants my help, it would be good if USAA kept me engaged.